Two friends getting married! How I picked the perfect Ohio Bachelor and Bachelorette party location and planned both! With all the things to do in Ohio, planning not one but BOTH, the Bachelor and Bachelorette party seemed a larger than life task! Where to start? How could I find some great Bachelor and Bachelorette party ideas in Ohio? I had heard of a place called Put-in-Bay from friends and decided to look into this Lake Erie Island as a place to host the Bachelor and Bachelorette party. A simple Google search took me to the helpful Put-in-Bay Visitors & Convention Bureau website where I started planning our joint Put-in-Bay Bachelor and Bachelorette party. Put-in-Bay Hotel? Resort? Home Rentals? Where to accommodate 60+people! There were lots of choices for Put-in-Bay Lodging and it was a difficult choice to make. I knew for safety reasons we wanted everyone in one location, nobody driving and we wanted to be close enough to the Put-in-Bay nightlife but in a quiet enough area that the older members of the party could get a good nights rest when tired. I decided on the Put-in-Bay Resort & Conference Center for several reasons primarily the large selection of different room types they had. Most of the home rentals we looked at required lugging our own sheets towels etc over for the weekend and that’s just not what we wanted to do on a Bachelor and Bachelorette party weekend. Amber the reservation manager was very helpful in selecting the right units for our group. Knowing it was going to be a joint Put-in-Bay Bachelor and Bachelorette party she recommended some of the Put-in-Bay Villas for part of the group which was just like rental homes but came with all linens provided like a hotel room and was part of the Put-in-Bay Resort complex. We rented 3 of the 8 person 4 bedrooms 3 bathroom villas which were equipped with kitchens, living rooms with a large screen TV and a really cool deck that overlooked a very nice courtyard. It was a perfect gathering spot for the whole group when departing for meals, activities and a few Bachelor and Bachelorette party games! The rest of the group we reserved a combination of 6 person suites and rooms that sleep 4 and created a room block for everyone to call in to reserve their room. The Put-in-Bay Resort and Amber made the whole process so easy! Out go the Save the Dates! Getting to the Put-in-Bay Bachelor and Bachelorette party half the fun! We opted to ride the Jet Express ferry for several reasons primarily due to the fact they arrive right in town where the action is and it was walking distance to the Bachelor and Bachelorette party location. Their late night schedule accommodated a larger number of our group who had to work on Friday and then make the drive to Port Clinton Ohio, the departure point for the Put-in-Bay Ferry. They had ample parking for our vehicles and the ticketing and boarding was easy. They even had a bar for those who needed a pre-arrival cocktail! Our trip took about 30 minutes and included a narrated tour with some interesting Put-in-Bay History. We passed by a really cool ship up on a cliff that we learned was a residence! People actually live in a boat on land on an island in Ohio! Upon departure and arrival, the crew of the Jet Express wheeled our luggage on and off the boat and the ride over was smooth as can be. Friday afternoon Bachelor and Bachelorette party at Put-in-Bay Let’s Get This Party Started! Check in time was not until 4 pm at the Put-in-Bay Resort, however, some of the rooms were ready early and they allowed us to check in early, store luggage and use these rooms to change to enjoy the pool. Wait did I say pool? That is an UNDERSTATEMENT This place has a swim up bar called the Blue Marlin, a 40 person MASSIVE jacuzzi and a DJ named Adubb who had the entire place having fun and enjoying the music. We saw people of all ages interacting with the DJ and having a blast. This place definitely set the stage for where we were going to be all day Saturday! Friday Night at Put-in-Bay! It’s GO TIME! With almost all of our group having arrived, we gathered at the Put-in-Bay Villas Courtyard for pre-dinner drinks and tried to decide where to go for dinner. Needless to say, keeping a group of this size happy with one choice in dining was NOT going to work! The helpful front desk clerk at the Put-in-Bay Resort suggested the Boardwalk Restaurant explaining that there were several types of restaurants in one convenient location.To everyone’s delight and my relief, there was a Mexican Bar & Grill called Rita Cantina, A cafeteria-style seafood area with lobsters, king cab legs, peel & eat shrimp, and a host of fresh fish sandwiches and entrees. After Dinner, it’s time for our first Put-in-Bay Bar Crawl! With most of our group having never been here before, we relied on the list of Put-in-Bay Bars & Pubs we printed out along with our trusty Put-in-Bay Island Guide to ensure we did not miss a thing! First up on the list and only becuase it was closest and right outside the Boardwalk Restuarant Complex was The Fishbowl. The two bartenders on staff early in the evening clearly were not expecting 50+ patrons to walk in all at once but did a fantastic job getting us all served separate checks and all. While a little smaller than some of the other Put-in-Bay Bars it had a neighborhood bar feel to it. We learned from the bartender that is also used to be the islands hardware store many years ago. Next stop was an outdoor location just a 1/2 block up on the right side called Mojito Bay. The bar looked like someone had disassembled it on some Carribean island, transported it here and reassembled it. Swings from the ceiling timbers served as some of the chairs and the entire floor was made up of a sandy mix. The entertainment was a fun male & female duo who engaged the crowd and our group in some lively well-known songs. I tried one of many Mojitos available and it was delicious! The rest of the crew enjoyed their own personal selections of frozen drinks, beers and liquors typically found at most bars. Next on the list was a bar on the corner claiming to be the worlds longest bar at the Beer Barrel Saloon. We stopped in for a drink and enjoyed a few songs by a group called Mustang Sally. Beers were the larger 16 oz variety and the bar was huge! By this time it was getting difficult to keep the crew together and some of the older members were ready for a peaceful nights sleep so we moved next door to a place called Mr. Ed’s Bar & Grill where many (including me) would call it a night.We entered on the first-floor level where a live band was playing and dancing was being enjoyed by many. I ventured up a back set of stairs to a second floor called the “Green Room” where I was greeted with a pleasant surprise the same DJ who was a blast at the Put-in-Bay Resort Blue Marlin Pool Par was also DJ’ing there! DJ Adubb recognized our group including the Bachelor and Bachelorette party bride and groom to be and played several songs for us and introduced the future Mr. & Mrs to the crowd! How Neat! By this time it was close to 1:30 am and like most of the Bachelor and Bachelorette party group I had worked all day and was ready for a good nights sleep and a fun Saturday at Put-in-Bay. Day 2 at Put-in-Bay! The Bachelor and Bachelorette party takes over the Blue Marlin Swim-up Bar! With the great time we all had on Friday afternoon, we knew the Blue Marlin Swim-up pool bar was where we would regroup, regather, and reload for another fun-filled day at Put-in-Bay. But first things first! NEVER start a day at Put-in-Bay without a GREAT BREAKFAST! We again relied on the front desk staff at the Put-in-Bay Resort to recommend to us newbies a place we could get a great breakfast. This would be the second time their recommendation was spot on! We enjoyed a fantastic breakfast at the Frosty Family Pizza Bar. We had walked past it on the way home the previous night and it was packed with party goers..who would have known this was the islands most popular breakfast place by day? I had the Egg’s Benedict and it was flat out incredible! We were able to be seated mostly in groups of four and six and despite their being very busy we were all in and out in less than an hour. A few of our group decided to get the morning started off with their wonderful Bloody Mary’s. After breakfast we hastily retreated back to the Put-in-Bay Resort to get our beach chairs grouped together as we were advised this was the island busiest and most popular swim-up pool bar and boy were they right! Every chair was occupied by 11 AM when our favorite DJ Adubb returned to start his show! The drinks at the Blue Marlin were reasonably priced, service was good and there was a back bar that was selling these strawberries filled with liquor and topped with whipped cream that were AWESOME!! I bet our Bachelor and Bachelorette party group bought over 150 of them! Mid afternoon we were all hungry but nobody wanted to leave the Blue Marlin and risk losing our seats as the place was clearly standing room only at this time! Put-in-Bay Pizza Company saves the day! Delivered to us right at the pool! I am kind of a pizza freak, VERY picky about pizza, and often reluctant to try a new place but as mentioned nobody wanted to risk losing a seat. The bartender gave us a menu from the Put-in-Bay Pizza Company A quick call to their delivery line 419-285-0504 and our order was placed! 40 minutes later our favorite DJ Adubb paged our name and the driver was standing there holding our pizzas! Too Cool! Our pizzas were about $23.00 each a little pricey I thought until I opened the box and WOW they were more generous with toppings than just about any pizza place I can remember. The pizza was cooked perfectly, crispy on the bottom, and the toppings were well cooked. There’s much more to Put-in-Bay Island than Pub Crawls and Swim Up Bars! Mid-afternoon on Saturday, we had enough sun and decided to explore the island in a little different fashion. 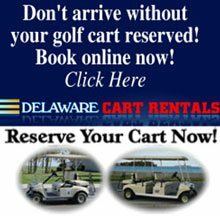 We rented golf carts from Put-in-Bay Golf Carts online (very handy online reservation system) and picked them up at their location just a block away. Helpful hint; We found a $5.00 off coupon on the Put-in-Bay Ohio facebook page. (note they also had golf carts at the Put-in-Bay Resort but were sold out) We rented an 8 passenger golf cart limo bus wagon and off we went to explore the island! We found all types of Put-in-Bay Attractions we did not even know existed! We saw caves to explore, wineries, parks and nature trails, biplane and helicopter rides, Jet Ski Rentals, a golf course and mini golf too! And the shopping!!! Interestingly some of the best Put-in-Bay Shopping was not right on the main strip but found on some of the side streets. Be sure to check out the shops next to the Put-in-Bay Hardware Store! Pretty cool stuff! We rented our golf cart overnight, so we decided to make a list of the places and things that we wanted to explore before leaving the following day. Saturday Night! Last night of the 48 hours of Ohio Bachelor and Bachelorette party weekend! Well here we were, our last night celebrating our Put-in-Bay Bachelor and Bachelorette party and we had yet to make a dent on the long line of various pubs and nightclubs on the island. We had decided the girls would do their thing and the guys would venture out on their own and we would most likely cross somewhere through the night. The girls started their Bachelor and Bachelorette party escapades with a nice sit-down dinner at the Reel Bar just a block or so from the Put-in-Bay Resort. The motif was rustic and an emphasis on fishing and Lake Erie oriented objects and was quite comfortable. There were half a dozen or so entrees on the menu and a wide selection of sandwiches, street tacos, and salads. I opted for the Lake Erie Perch and fries and it was excellent. Large parties always seem to be a problem for restaurants but not here as the group was in and out efficiently with everyone’s hunger well satisfied. Bachelor and Bachelorette party girls on a mission! There were so many Put-in-Bay Bars left to see and such a short time to do so! We started at a country bar called T&J’s Smokehouse where an outdoor country band was playing. Next up we breezed thru the Boathouse, The Round House, a return to the Frosty Bar and met up with the guys back at Mr. Ed’s Bar. I had resigned myself that Put-in-Bay was just too much to even try and take in over a 48 hour weekend. I could never begin to do justice to the myriad of other nightspots, restaurants and interesting places we saw but did not have the time to fully explore. Our 48 hours at Put-in-Bay tour is almost over and I feel as if I just got here! After enjoying the complimentary continental breakfast at the Put-in-Bay Resort we packed up our bags and requested the front desk store our luggage so we could do a little last minute Shopping and explore other things to do at Put-in-Bay. We rented a golf cart from the front desk and off we went! We drove thru a stunning State Park with a beautiful beach called the South Bass Island State Park. We stopped at the office to inquire about camping at Put-in-Bay. The State park had primitive campsites as well as a few bungalows that were perched on a hill to the right as you enter. Our next stop was the Put-in-Bay Airport where we watched a few of the takeoffs and landings by the helicopter and the antique Waco airplane giving rides. Definitely looked like a fun time but the waiting time was well over an hour so we had to pass. Our final meal on the island was the Put-in-Bay Restaurant known as the Goat Soup & Whisky. Our server suggested the Perch Tacos and they were phenomenal! I opted for the 2 taco serving which was plenty with french fries on the side. My girlfriend kept it light with a cup of one of their homemade soups and a perch sandwich. We sat on an outdoor deck watching the world go by and the service was as good as the food! On the first floor, just under the restaurant is another hidden Put-in-Bay Gem, the Chocolate Factory & Museum. The shop features exhibits about the history of chocolate, a wide variety of chocolate creations and hand dipped ice cream cones and milkshakes. To full from lunch to enjoy, I did opt to have a small assortment of chocolate creations boxed up to take home! 48 Hours is just not enough to enjoy everything at Put-in-Bay! As early afternoon arrived the reality was setting in that it was time to grab our luggage and depart back to the “real world” and the daily grind. As we said our goodbyes to each other and boarded the Put-in-Bay Jet Express Ferry for the ride home, I felt a sort of melancholy as the ferry pulled away, as if I was leaving a home, friends, and lifestyle behind. This little island treasure certainly has a way of touching you in a manner that begs your return and return I will, but for sure with more than 48 hours to enjoy Put-in-Bay Ohio, the gem of the Lake Erie Islands!